Gilfach Wen provides a venue and support for a full range of Forest School activities. This small farm adjacent to Brechfa Forest provides both the perfect venue for training Forest School Leaders or hosting Residential Forest Schools for children of any age or adults. We can support urban Forest Schools and youth groups wanting to undertake activities in the countryside as well as family groups or corporate team building events using Bushcraft skills. A Forest School is an outdoor classroom where participants can develop social skills while exploring the natural environment. Forest schools originated in Scandinavia in the 1950’s. Their success has resulted in them becoming very popular in the UK in the last decade. Its easy to see why they can be so effective, for example what better way of teaching maths or building self confidence and team working than the process of designing and building a shelter or bridge between two trees. Sounds like fun? We believe that it shouldn’t be just children who have all the fun. Foraging for food and building a campfire is empowering for anyone. That’s why we don’t just support forest schools but also run bushcraft courses for families and team building events for employees. We have both a 4 star bunkhouse sleeping groups of up to 32 people, and space for camping. In the ideal world every Forest School would have the sole use of land near the school for activities such as shelter construction, bushcraft, bridge building, map reading, green woodworking or artwork with natural materials. Sadly for most urban forest schools space is limited and may be shared with other people. At Gilfach Wen you have the space and privacy to make shelters and stay in them overnight, build camp fires and cook over them, build a bridge over a stream, enjoy peace and quiet or just walk through open countryside. 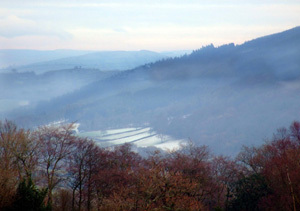 The farm is adjacent to Brechfa Forest, in the middle ages this forest was a royal hunting ground. In 1919 the Forestry Commission became managers of the forest. They have expanded it into the largest man made forest in Europe, creating a 50 square mile multi-purpose forest for timber production, recreation and wildlife conservation. Support is available from experienced local forest school leaders. Forest school leaders used to working in an urban environment may find the idea of working in a rural setting or camping out overnight daunting. It can also be very time consuming to study the local area and locate materials for your chosen activity. We offer the services of a selection of experienced, qualified leaders with local knowledge who would be available to join your team.